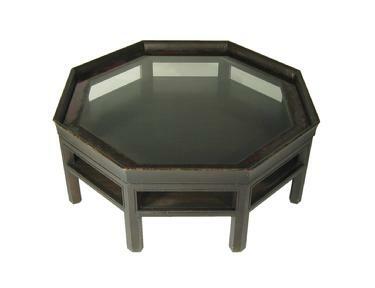 Octagonal form cocktail table with eglomise decorated inset glass top and lower shelf. Overall very good condition. Complete and very solid. There are no significant dents, dings, scratches, or other damage. There are significant finish chips along the top of the table. While these finish losses suggest a full restoration, there is no significant damage to the underneath wood. Minor but noticeable wear to lower shelf. Glass is complete with no chips. There is a brown eglomise border to the eight sided glass insert which shows significant losses. There are noticeable surface scratches to the glass. This is an important early Baker modern cocktail table. 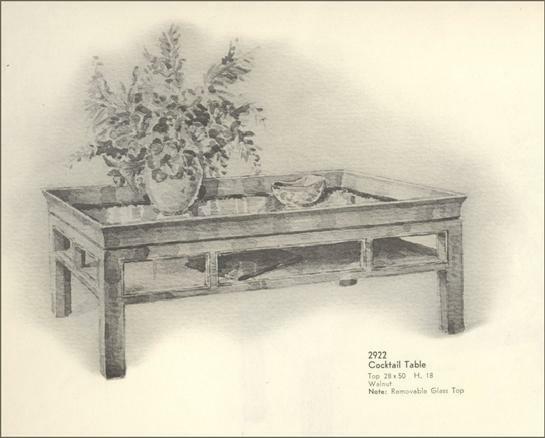 We have earlier had an example of the rectangular version of this table which refinished quite nicely.